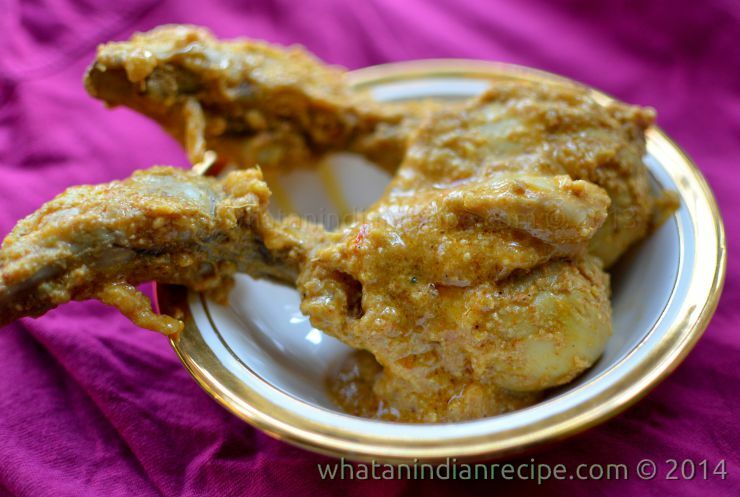 Chicken Chaap is a very popular dish from Kolkata, a part the Awadhi cuisine. It’s easy to cook, blended with readily available spices, a must try for any Mughlai food lover.If the meat has high amount of fat, then you’d need to use less oil/ghee. Wash the chicken, use a fork to prick the chicken pieces. Mix all the ingredients for marination, and allow the chicken to marinate in the refrigerator for at least 3-4 hrs (overnight marination will give you the best results). Take out the marinated chicken & allow it to come down to room temp. In a kadhai/wok, heat the ghee, shake off the marinade from the chicken & fry the chicken pieces till they are half done. To this add the marinade along with the kesar strands with milk. Now, cook till the chicken is tender, and finally add the poppy seeds paste and mix well, cover & cook well for 5 mins on low flame. Once the gravy thickens add rose water & remove from fire.